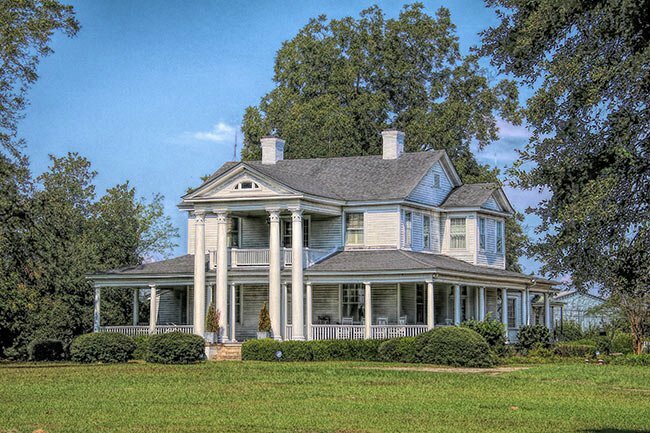 Young Farm, located between Florence and Timmonsville in Florence County, now consists of a main residence and an abundance of outbuildings associated with farmer Fred H. Young. Young first earned renown for his high-quality cotton seed, which reputedly produced 22 bales of cotton on just eight acres. However, when the boll weevil swept through the South and devastated cotton fields, Young expanded into the dairy business. Young purchased his first cow in 1916, a registered Jersey named Belle de Sarah. He slowly increased his herd and, by 1923, began to systematically document his yields. In this first year’s data, Belle de Sarah produced 858.1 pounds of butterfat and 16,373 pounds of milk, a record in the South. For her buttermilk production, she also won a “Medal of Merit” from the American Jersey Cattle Club. Several of Young’s other cows won medals over the years as well, including Blue Fox’s Eminent Sultana, Fontaine’s Golden Florence, and Sarah’s Golden Spot. Young soon gained the attention of Herbert Hoover, then our country’s Secretary of Commerce. Hoover visited the farm in 1925 and concluded that South Carolina made as an excellent location for dairy farming. 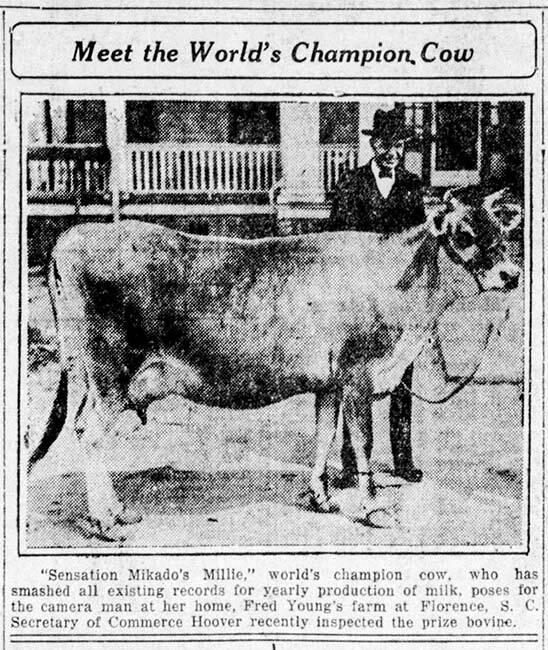 A year later, in 1926, Young gained national notoriety when his cow, Sensation Mikado’s Millie, set a world record for butterfat production in the senior Jersey class. She yielded 13,303 pounds of milk and 850.81 pounds of butterfat, making her the first two-year old of any breed in the South to set a world record. CAPTION: “Sensation Mikado’s Millie,” world’s champion cow, who has smashed all existing records for yearly production of milk, poses for the camera man at her home, Fred Young’s farm at Florence, S. C. Secretary of Commerce Hoover recently inspected the prize bovine. Young Farm later served as a model of dairy farming in the state, especially since Young began with such a low budget. In the 1940s, a “Forage and Feed School” took place at Young Farm. A cow forage and feed school will be held at 10 a.m. today at the Fred H. Young’s farm between Florence and Timmonsville. It is being staged for the benefit of the county farmers. C. G. Cushman, dairy extension specialist, will discuss feed and feed requirements for all livestock on the farm. He will show relationship of livestock and crops, forage production as a part of farm enterprise. Pastures and various other crops will be discussed by others present well qualified to handle the subject. Mr. Phagan, head of the department of farm engineering, will give a demonstration in adjusting ensilage cutter blades, proper speed of cutter, proper length of cut, and also care and adjustment of mower. This is especially important as hay cutting time is here. Some of the crops planted for demonstration are o-too-tan soybeans, corn and blioxl soybeans, sorghum, pasture and pearl millet for grazing. Mr. Young’s farm has produced two world record jerseys and 10 state records for production. Among the many fine blooded animals, which can be seen at the farm, is Design Royal Dream Queen, the cow which will go to the National Jersey exposition in Columbia, Ohio, October 12. She will be the first cow from South Carolina to qualify for this honor, “The Sale of the Stars.” Plans are being made for the large crowd which is anticipated. While most known for its dairy products, Young Farm continued to farm cotton and also branch out into other crops. In an article appearing in the Florence Morning News on May 31, 1952, a brief mention of Ed Young, son of Fred H. Young, states “he and his father have 110 acres of permanent pasture for the Jerseys. Temporary pasture land is planted in millet and soy beans. 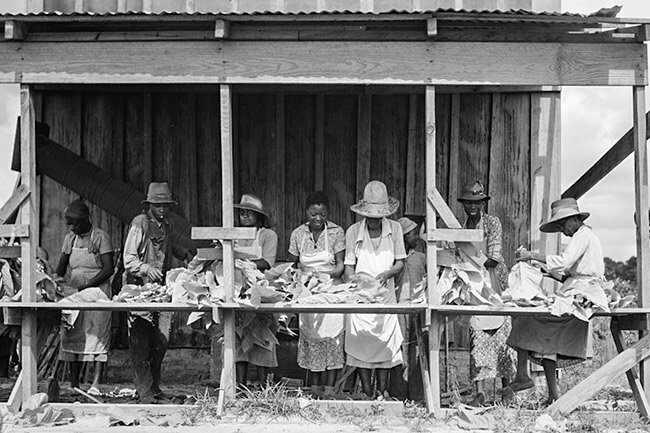 The Young’s don’t limit their farming activities to dairy work; this year they are growing 100 acres of cotton and more than 32 acres of tobacco, plus grain for the dairy herd.” Tobacco was the leading cash crop in the Pee Dee region, where scenes like the one pictured below were commonplace. 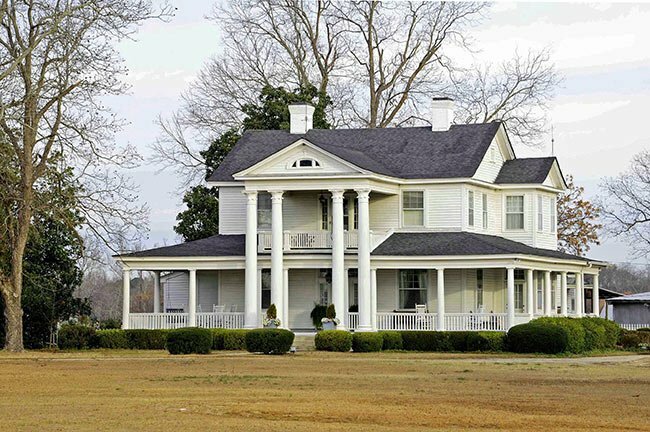 The house on the property – originally a single story – was built in 1877 by William Henry Young, Fred’s father. Fred enlarged and remodeled the house in 1919, and the house was completely renovated in the late 1960s with a one-story addition in the rear. Outbuildings on the property include a cow shed, dairy barn, office, truck shed, and a collection of silos. All contribute to the historic fabric of Young Farm. The Young Farm is a collection of buildings associated with the dairy farm of Fred H. Young. The farm is significant for its association with Young’s achievements in the field of agriculture. The complex consists of a two-story frame main residence and a collection of outbuildings including a dairy barn, truck shed, cow shed and silos. Fred H. Young, a farmer and partner in Young’s Pedigreed Seed Farms, first won regard throughout the South for his high-grade cottonseed. When the boll weevil drastically reduced cotton production, Young decided to expand into dairy farming, and about 1916 he began his herd with the purchase of Belle de Sarah, a registered Jersey. He slowly and steadily increased his herd and in 1923 decided to begin scientifically testing the yields of his cattle. Belle de Sarah was his first test cow and in her first test year produced 858.10 pounds of butterfat and 16,373 pounds of milk, making her the highest record cow in the South and the first southern cow to win the American Jersey Cattle Club medal of Merit. Young’s continued success was cited as proof that dairy farming was well suited to South Carolina. 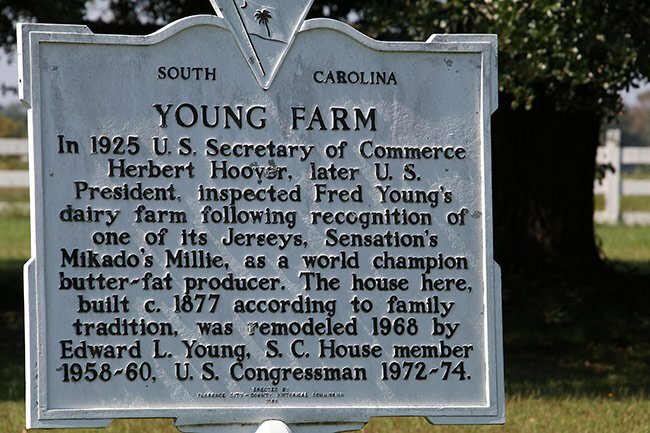 Herbert Hoover, then secretary of commerce, visited the Young farm while in Florence in 1925 and expressed his belief that South Carolina held great potential for dairy farming. Young’s farm was seen as a model operation and his modest beginnings and low cost operation were recommended for emulation among aspiring dairy farmers.